My friends, strawberry season is fast approaching. Soon we will be feasting on fat, juicy, ruby red berries of the gods! I’m may be jumping the gun a bit with these scones, but I can’t wait anymore. 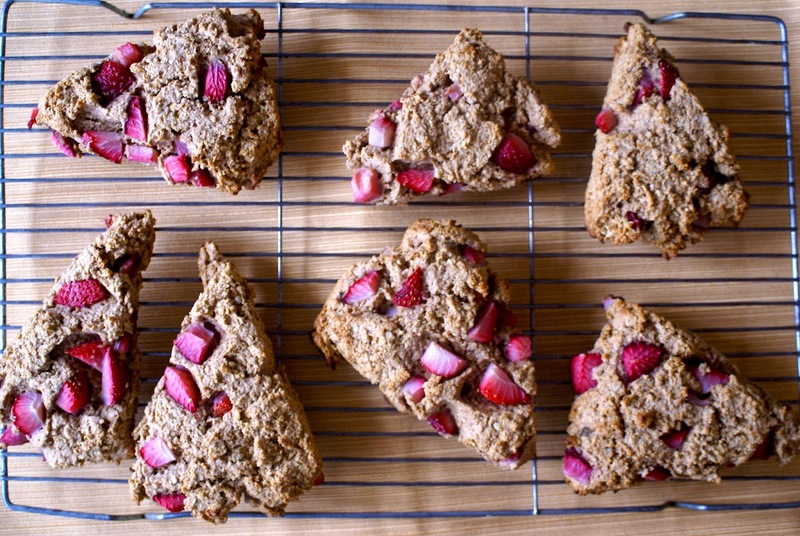 The strawberries in the market have been calling my name, so the other day I gave in and bought a pint with big plans to turn them into scones. Well, turn half of them into scones. The other half I ate right out of the carton. I recommend you do the same! With no oil, refined sugar, or refined flour, these scones are a perfect natural alternative to classic scones. Did I mention they are dairy-free and egg-free? You don’t need butter and eggs to make delicious, moist scones. This recipe also does not require cutting a fat into the flour in order to achieve a light, flaky texture. 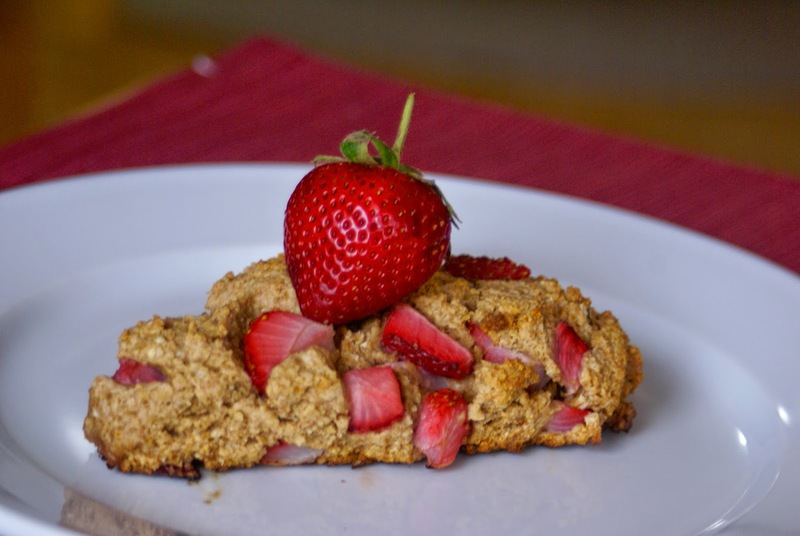 Coconut milk combined with almond butter leaves these scones plenty moist and pairs perfectly with the delicate strawberries. 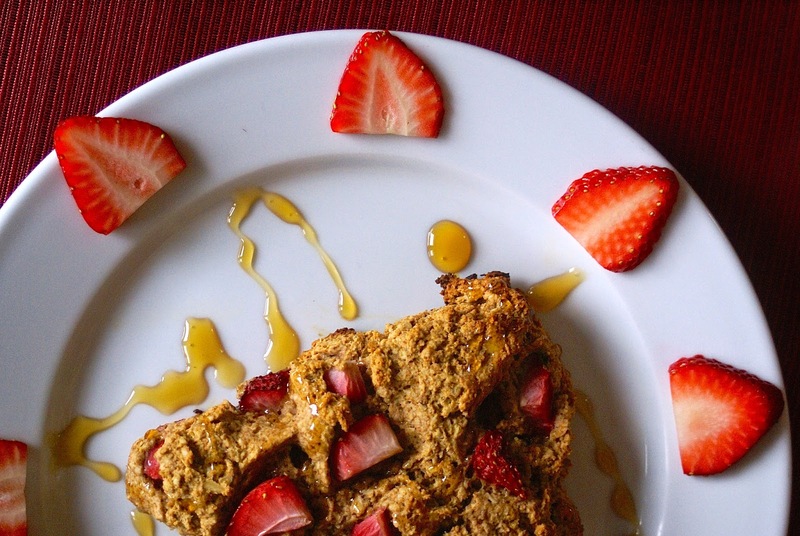 Lemon and ginger help bring out the strawberry flavor while honey adds a touch of sweetness. 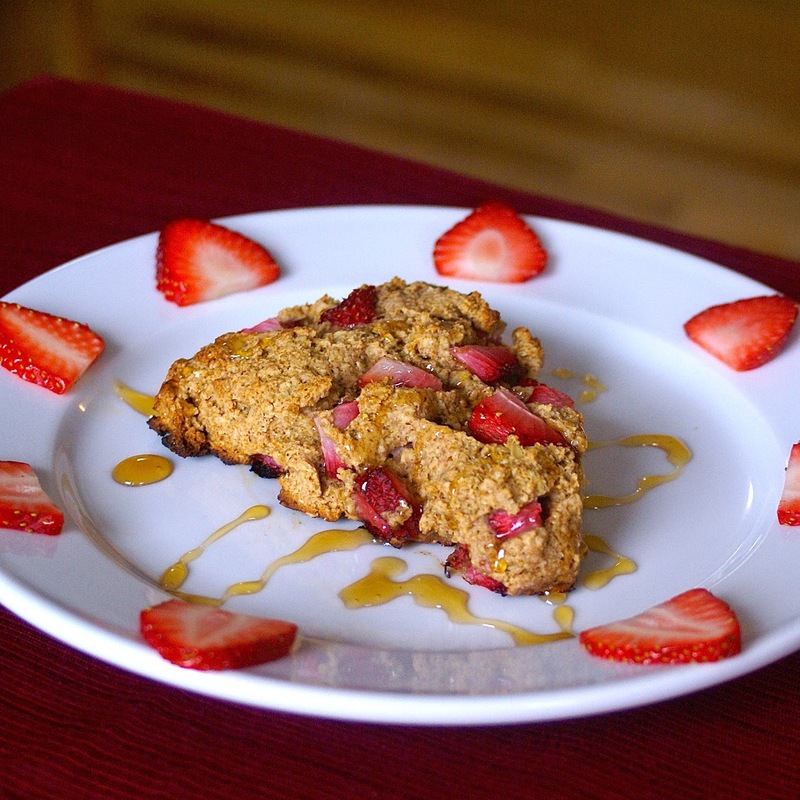 I drizzled honey over these scones before serving, however my recipe for sweet lemon cashew glaze would be delicious as well! I hope you are having a wonderful weekend! 1. Preheat the oven to 400 F. Line a baking sheet with parchment paper. 2. Whisk together the flours, baking powder, baking soda, salt, ginger, and flax seeds in a bowl. 3. In a separate bowl, whisk together the coconut milk, lemon juice, lemon zest, honey, almond butter, and vanilla. 4. Slowly add the dry ingredients into the wet ones. Gently fold in the strawberries (I find it easiest to use your hands for this part in order to not squash the strawberries). 5. Shape the dough into a flat disk on the prepared baking sheet, about an inch high. Using a sharp knife, cut the circle into eight equal pieces and gently separate them so there is at least an inch of space between each scone. 6. Bake for 18-22 minutes in the preheated oven. Let cool on a wire rack. 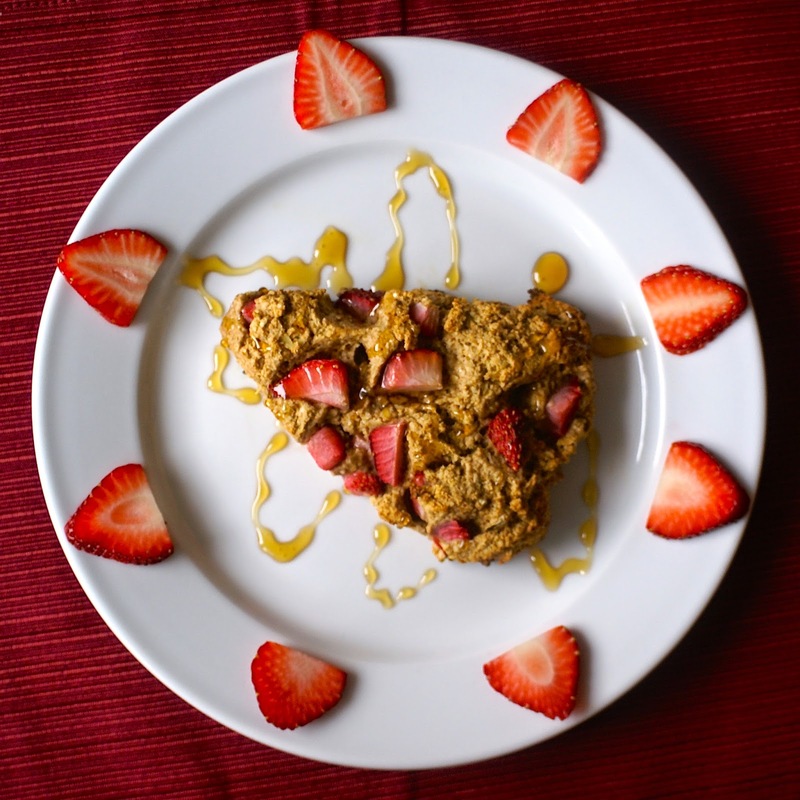 Drizzle with honey or sweet cashew icing and enjoy! I do, in small doses. That's why I use half oat flour in these scones. But each one is so satisfying, one is plenty for me (topped with some almond butter and honey of course)! Thank you! They are pretty delicious; let me know how they come out when you make them! Bigger = better? Haha glad you liked them!